“Our Rational God: Fitting the Pieces Together and Making Sense of Them” from Christian Faith Publishing author Ken Woodburn translates the Bible and other ancient Jewish texts into a modern context. To truly understand the Word of God from the Scriptures, readers would have to spend years studying ancient texts, so author Ken Woodburn decided to offer a simpler approach. “Our Rational God: Fitting the Pieces Together and Making Sense of Them”: a common man’s guide to Biblical study. “Our Rational God: Fitting the Pieces Together and Making Sense of Them” is the creation of published author, Ken Woodburn. Ken Woodburn was born and reared in Texas. After a hitch in the US Air Force and the help of the GI Bill, he graduated from the University of Texas at Tyler, formerly Texas Eastern College, in 1976. He was hired as a locomotive engineer one year after graduation by the Santa Fe Railway Company, which became BNSF RY. He spent the next ten years riding the rails during the great Russian Wheat Rush of the 1970s and early 1980s. Ken eventually went back to school while working as a Registered Respiratory Therapist. As part of a hospital outreach treatment program, Ken treated elderly nursing facility residents with pulmonary conditions. He completed a full year of post-graduate work toward a NFA license at Texas State University, formerly Southwest Texas State College, at San Marcos, Texas, to become a healthcare administrator. Before retiring in 2006, Ken started a real estate investment company with his retirement savings. His change of career made it possible to complete his spiritual manuscript. Today, Ken is very active in the faith. He currently helps families find good homes and schools in East Texas as the CEO of Zanneth Properties, LLC., which is located in Hallsville, Texas. Published by Christian Faith Publishing, Ken Woodburn’s new book is the common man’s guide to the Bible. Only a theologian with years of study can truly make sense out of what God is trying to deliver in the Bible. The approach of author Ken Woodburn is much more productive for the casual Bible reader. In “Our Rational God,” Ken takes a common man’s approach to Biblical study. Many people have heard much of what the Bible says, but it is generally not enough to give them the desire to devote vast amounts of time to the pursuit of its true meaning. Ken uses the Bible and other ancient Jewish texts as references, but translates their messages into a modern context. In doing so, he provides simple and clean answers to the issues people face today. View a synopsis of “Our Rational God: Fitting the Pieces Together and Making Sense of Them” on YouTube. Consumers can purchase “Our Rational God: Fitting the Pieces Together and Making Sense of Them” at traditional brick & mortar bookstores, or online at Amazon.com, Apple iTunes store, Kobo or Barnes and Noble. 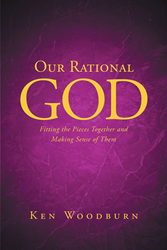 For additional information or inquiries about “Our Rational God: Fitting the Pieces Together and Making Sense of Them”, contact the Christian Faith Publishing media department at 866-554-0919.